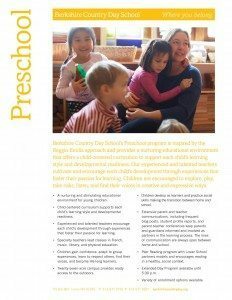 Inspired by the Reggio Emilia approach, Berkshire Country Day School’s Preschool program provides a nurturing, stimulating educational environment that supports each child’s learning style and developmental readiness. Experienced teachers encourage children to play, take risks, listen, and find their voices as they explore the many resources of our historic 27-acre campus—from our beloved playground to the new Kim and James Taylor Music/Performance Space. Recently remodeled preschool rooms provide ready access to the outdoors, where teachers use the natural world as an extension of the classroom, connecting play and learning. Preschoolers use the pond and the miles of hiking trails, bringing back found natural materials to use in classroom projects. Extensive communications keep parents and guardians informed and involved as partners in the learning process. A variety of enrollment options are available including an Extended-Day Program until 5:30 p.m. Developed in Italy in the 1940’s, the Reggio Emilia approach has been embraced worldwide, considered by many to be one of the best and most innovative models for early childhood education, and one that is most consistent with the way young children learn. Reggio-based programs share a core belief that every child brings with them deep curiosity and wonder and that each child is full of potential and interests. Teachers view each child as strong, resourceful and resilient. The program begins by learning about the interests and abilities of each group of children, finding out what fascinates them, and using that as a springboard for introducing various components of study. Reggio teachers share a conviction that children are capable of contributing to their own learning through investigations and that their curiosity drives their interest to investigate. The teacher’s role in a Reggio classroom is that of a mentor who works collaboratively with the children to facilitate these investigations. Literacy skills progress through imaginative play and exposure to literature, storytelling, songs, reflective listening, and class meetings, developing a rich base in expressive and receptive language. Our Peer Reading program models and encourages reading in a healthy, social context with lower school partners. Early math concepts are explored through hands-on use of materials such as manipulatives, puzzles and blocks to promote the understanding of concepts, patterning, sequencing, sorting, comparing, and spatial relationships. Children begin to learn about the science process by engaging in concrete activities such as observing plants grow, caring for animals, following the weather, and researching at the pond. The social studies curriculum emphasizes knowledge of families, communities, and the broader world, empowering students to feel connected and confident in school and in life. Specialty teachers lead classes in foreign language (French and Spanish), music, library, and physical education. Children sing, dance, play rhythm instruments; act out stories during music class; and listen to music from all over the world. BCD’s recently remodeled preschool rooms are open and bright, and provide ready access to the outdoors. The natural world is an extension of the classroom and used throughout the day to connect play and learning. Students use the pond and the miles of hiking trails as well as using found, natural materials in classroom projects. An adjacent playground offers easy access to outdoor fun. Purposeful work and play nurture and develop social skills and cooperation. Students have opportunities to be creative every day, using a variety of materials to stimulate their imaginations through art and other project-based activities. Children’s remarks, photographs of work and representations of their thinking and learning are used by the teacher to document and hypothesize about the direction of learning. These are displayed in the classroom and shared with visitors. Children gain confidence, adapt to group experiences, learn to respect others, find their voices, and become life-long learners. Learn more about this incredible preschool education that’s quintessentially the Berkshires! 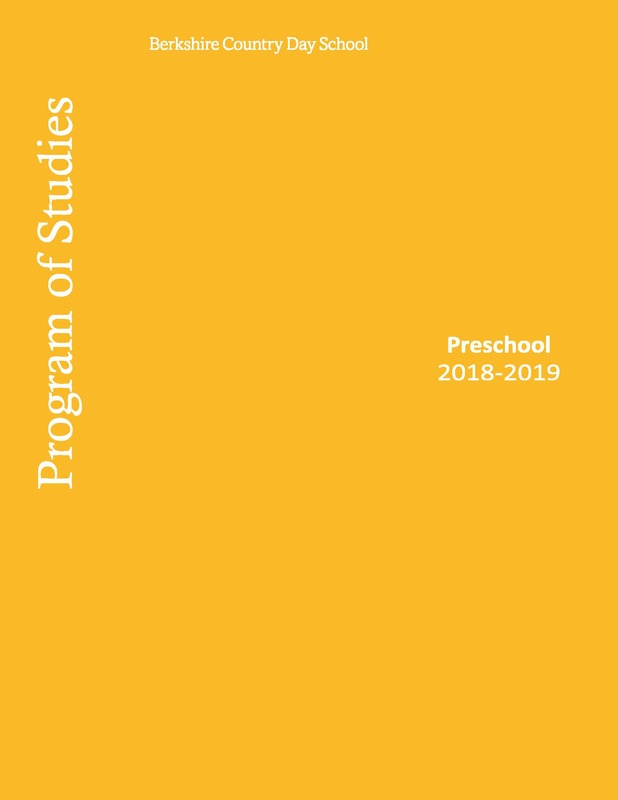 In its second year: Two-year-olds program! In response to growing demand, we have expanded our preschool program to include two-year-olds. This Reggio Emilia-inspired program, enrolling up to 10 children aged 24-35 months, is led by two experienced educators in a flexible classroom suite to allow for shared project and play time with our existing 3 & 4-year-olds program. Children enjoy ready access to the many resources of our historic 27-acre campus—from our beloved playground to the new Kim and James Taylor Music/Performance Space. We offer a variety of enrollment options from 3 half-days (8AM-12PM) to 5 full-days (8AM-3PM) and after school care is available as needed (3-5:30 PM). Julia Kreilkamp joined the faculty as our two-year-olds lead teacher for the program’s inaugural year in Fall 2017 and moved to our three- and four-year-olds classroom in Fall 2018. 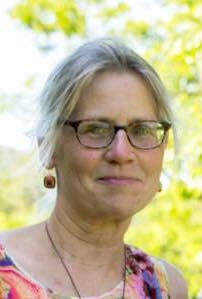 Julia has over twenty years of teaching experience, most recently prior to BCD for ten years as the PreK teacher at the Middletown Springs School in Vermont. Julia received a B.A. from Macalester College, and a M.A. in Elementary Education from College of St. Joseph. Of special note, Julia received the University of Vermont’s Outstanding Teacher Award in 2010. We have been impressed with Julia‘s strengths as an educator, teacher, and communicator. Carli Imreh-Alegretta, who previously served as the assistant teacher in the “B2s,” is now the lead teacher in that class. Warm, caring, and engaged, Carli ensures our youngest students are well cared for as they explore their world, as she also adds in lots of fun and play! It is exciting to witness the many opportunities that our youngest learners experience everyday in the hands of these capable and compassionate educators!